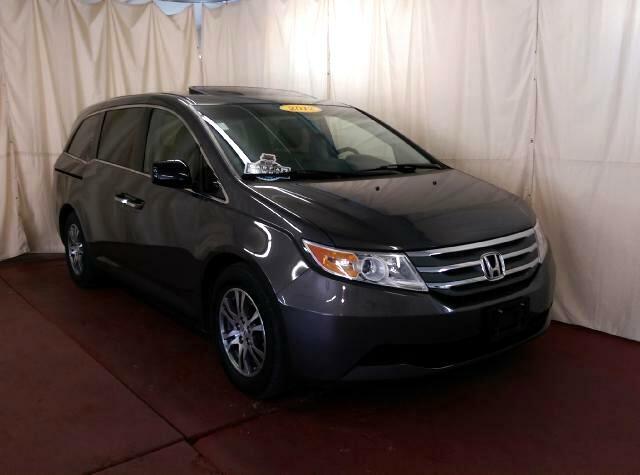 Meet our 2012 Honda Odyssey EX-L shown here in beautiful Alabaster Silver Metallic. Open the hood and you'll find a 3.5 Liter V 6 tied to a smooth shifting 5 Speed automatic transmission producing 248hp and scoring 27mpg on the open road. Surprisingly sporty and fun to drive, this minivan will impress you with its confident handling and acceleration. It's no wonder the Odyssey received the MotorWeek Drivers' Choice Award for Best Minivan for the 6th time in 2012. The aerodynamic exterior design of our Odyssey adds style as well as function with a lightning-bolt side profile and sculpted bumper. Imagine yourself behind the wheel and experience the quiet, refined interior--you may think you're in a luxury sedan! Designed with your busy family in mind, it features child friendly power-sliding side doors, tri-zone automatic climate control,and a multi-adjustable second-row seat. Bluetooth technology, heated leather front seats, a chilled storage box, and satellite radio are nice conveniences for an active life style. ACE body structure, stability assist, an army of airbags, and smart anti-lock brakes will safeguard you. Tried and true, our Odyssey is built for family so go ahead and get outdoors enjoying those leisurely road trips ! Print this page and call us Now... We Know You Will Enjoy Your Test Drive Towards Ownership!